Everyone has different training techniques and exercises. The use of cavalleti, trot poles, jump chutes, and cones can help your horse in many ways. Trot poles in particular are a fairly easy tool to help teach your horse new movements. Most people who jump or board somewhere that has jumps have access to poles to use for exercise. If you do not, you can easily attain some landscaping timbers to achieve the same. Lowes, Home Depot, and Walmart all sell them fairly inexpensively. They are usually much shorter than your average jump pole (which are 12 feet long) but will work for most exercises. Today we will explore a couple of trot pole exercises to help train our horses. Let’s begin with a horse who has trouble lengthening. This horse has good basic flat work, but has not been able to develop good reach in his stride. To help this horse you can use a very simple trot pole set up. On average most people will use 4-5 poles at once. In basic striding these will be somewhere between 3-4 feet apart at the beginning. This is average for a horse’s step at the trot. Start by allowing your horse to trot through them a couple times so they get used to the idea. Once they are desensitized it is time to start increasing the distance. This way, you can keep a good working trot before and after the poles, asking for the bigger step while within the poles. If you have never done this exercise before and you get the horse to stretch to 5-6 feet between each pole near the end of your ride then you have accomplished something. As with any training tool, achieve the best result you can for the day and work on more another time. How about a horse who has trouble lengthening and compressing his stride? Another pole exercise for that type of horse would be what some people call a “fan”. A fan is building on your basic pole exercise making it more complex. When you build a fan start with 4 poles. At the outer edge place them 9 feet apart. At the inner edge they should be 3 feet apart. This exercise lets you work on a circle to help your horse understand where to place his feet. If you work on the innermost circle you work on collection at the trot. As your horse understands the exercise you can move outward on the fan to practice lengthening on the circle. If you end up working on the outermost part of the fan you will need to canter and it will help teach your horse to keep an even step. If your horse is a bit hotter minded this is a good exercise because it lets the rider keep the horse on a circle (which aids in slowing them down) and helps to teach them to balance. 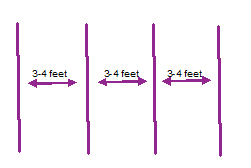 Another exercise you can use would be to raise every other pole, but to keep them on the same 3-4 foot stride. This will help teach your horse lift and engagement. It is also a good exercise for young horses as it teaches them to be aware of their feet. When starting the above exercise it is important to remember to start with the poles on the ground to make sure the horse is confident going through them. Then only raising one pole. If the horse knocks it down it’s not a big deal because they might not understand the question. Just replace the pole and try again. Most likely the horse won’t hit it the second time around. If he figures out the exercise pretty easily then raise another pole so that he has to work a little harder. Eventually you can switch out which poles are raised and which are on the ground to practice teaching your horse to be careful. 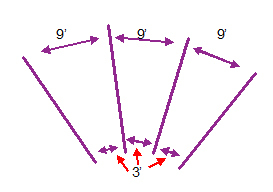 A modification of this exercise would be to only raise one side. This will still achieve much the same result, but can be used with horses who are a little backed off by the exercise or who continually have trouble understanding what is being asked of them. By raising one side on every other pole (on opposite sides) you can create a straightness exercise as well. This is good for horses who would rather run out than complete the whole set of poles. Whatever exercise you choose to use, it is best to not drill for hours or multiple days in a row. While these are excellent strength building ideas, you don’t want to create a sour horse because they haven’t had a change of pace. Like people, horses appreciate different lessons to keep their brain stimulated. We want our horses to come to the arena each day willing and ready to learn something new.